“...President Buhari, on coming into office in 2015, ignored the looming economic danger and focused single-mindedly – and, in retrospect, unwisely – on the fight against corruption and the recovery of stolen asset which had populist appeal. Let me quickly congratulate all of us on this anniversary of our Independence before returning to the quote above. Against all odds, we stayed together as one indivisible country despite agitations here and there for the collapse of the current problematic union. We even fought a very bloody civil war which terminated the lives of millions of our brothers and sisters. Since then, we’ve continued to fumble and wobble along. In the middle of this celebratory mood, the ruling party APC is in a messy and not so merry situation despite winning the gubernatorial election in my home State of Edo just days ago. The reason is not too far-fetched. As a matter of fact, it is a self-inflicted injury. A political party that came to power with so much credibility and adulation last year is already becoming a house divided against itself by fighting on all fronts from within and outside its folds. I would have expected that useful lessons would have been learnt from our recent past. Alas! The prophecy of this war of attrition had been long foretold by those who saw this marriage of different political parties as an amalgamation of strange bedfellows. The election that ushered in the government of President Muhammadu Buhari travelled with so much hope and promise. This promise also carried within its underbelly the burden of heavy expectations. Many had hoped and expected that the APC was ready to hit the ground running from Day One and that President Buhari had a masterplan ready and handy. Nigerians actually expected instant magic. President Buhari was believed to possess talismanic powers to solve all problems and the capacity to sweep out the sins of Nigeria, especially the endemic corruption that has grown malignantly cancerous, within a twinkle of an eye. But so far, nothing of the sort has happened. Many Nigerians are already in a state of stupor trying to figure out what went wrong and what go right in the near future. Trouble started as soon as the government started. It was as if the government was conceived in perfidy and had to be delivered in strife. First, they started fighting over positions once it was time to share public offices. The National Assembly was the hotbed of rebellion and hullabaloo, the place where the falcon refused to hear the falconer. For whatever reason, the party picked on one of its bright stars, Dr Abubakar Bukola Saraki, who had chosen to fulfil a lifetime ambition of becoming Nigeria’s President of The Senate by fire and by force. The party apparatchik would never agree to such heresy. This would cause so much rancour and put the ruling party in disarray. The ding dong affair between The Senate and the Federal executive would be a test of will and strength between the warring factions. Try as it may, the Senators overwhelmingly supported their leader and the seed of discord had been sown almost permanently. The Federal House of Representatives suffered its own version of the crisis but its Speaker appeared more amenable to control from the invisible but supernatural forces from outside its chambers. The party was thus able to keep the combustion from exploding while real fire burnt wildly in the nearby Senate chamber. It was in the midst of this that the Senate went through the screening exercise for Buhari’s cabinet nominees. The time it took to announce and release the list of Ministers was another case of hocus-pocus. Mercifully, the screening and ratification commenced and was dispensed with after some melodrama. But the ember of discord was still burning slowly and steadily away from public or prying eyes. After some unsavoury sessions at the Code of Conduct Tribunal and a few complicated legalese, members of the public lost interest and attention and concluded the case was possibly dead on arrival. As if this war was not bad enough, the economy took a nose dive and the Naira has continued to sink deeper and deeper in the abyss. There was a gale of arrests of allegedly corrupt people reminiscent of Buhari’s days as a military ruler. The enthusiastic supporters of the war against corruption would soon turn against the same government that seemed determined to restore sanity to our socio-political climate. Buhari and company had failed to study the psychology of homo sapiens. If Nigerians had lived and survived substantially on corruption, it should have occurred to Buhari and his team to replace something with something. A hungry man is an angry man. Enu ofifo kii dun yanyanmu, (an empty mouth can never make sufficient noise), according to a Yoruba adage. If as corruption collapsed like the walls of Jericho, food prices also crashed and prosperity beckoned, there would have been no problem. In fact, things got worse rather than change for the better. Nigerians are angry not because they hate Buhari or really miss PDP but life is just becoming unbearable while the politicians to live large in most cases. The government itself has not provided palliatives and even reneged on some of its campaign promises. The government has turned to preaching and heaped all the blames on its immediate predecessor who became the lamb of God programmed to carry away the sins of PDP in 16 years. Members of opposition protested vehemently against what they called a vengeful witch-hunt against their party, the PDP. The ruling party says PDP has put Nigeria in this mess and should pay dearly for it. No doubt but how do we move forward? There are important issues to tackle and it seems the Federal Government has not been able to overcome the many challenges confronting it. The economy has been its greatest albatross as well as the cold but volatile wars between its gladiators. The tussle for power started so early. Nigerian politicians do not joke with power. They start jostling for power from the end of the election. Nothing should pass them by. And those who manage to grab power often forget those who brought them to power. In fact, they usually have a mortal fear of the kingmakers and try to keep the distance from them. Afobaje loba koko nge lori, (the King wastes no time in beheading the kingmaker). The reason is simple. No one wants to be reminded of his past or be held to ransom by those who helped him climb the ladder. Such is life. There is no doubt that Asiwaju Bola Ahmed Tinubu was in the forefront of those who midwifed this government in cash and in kind. But despite his humongous efforts, the relationship between Asiwaju and this government has been that of cat and mouse. It did not start today. It actually started being frosty long before the election. First, Asiwaju wanted to be the Vice President but Buhari was said to have excused himself on account of Muslim/Muslim ticket and skilfully settled for one of his close associates, Professor Yemi Osinbajo, a technocrat and Pastor of The Redeemed Christian Church of God. 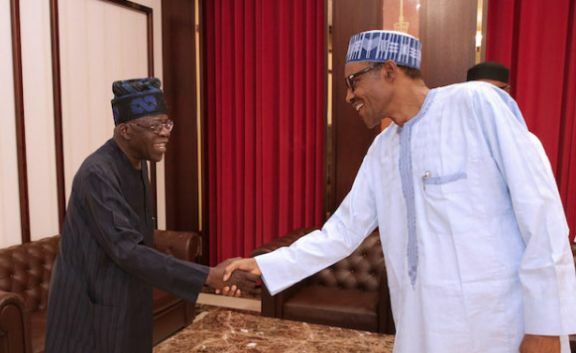 Next, Tinubu was interested in who becomes Senate President and Speaker of The House of Representatives. Somehow, this also became elusive. It is not clear till this day if the President was actually interested in any preferred candidates. But it was certain that some subterranean forces were stylishly blocking Tinubu from having too much clout and stranglehold on the party. While I do not think he can have his way always, I believe he should be carried along. His vast knowledge of politics and governance would be very useful at this critical moment. It seems APC has already touched the tiger by the tail and should seriously watch out for possible backlash. My honest advice to President Buhari, as always, is not to listen to those goading him on and telling him he can win all battles. I will borrow him a Yoruba proverb: “bi adete ko le fun wara, o le danu!” (if the leper cannot milk the cow, he can spill the ready milk!). President Buhari should remember the conspiracy that ruined the PDP and eventually catapulted President Goodluck Jonathan out of power. If we don’t know where we are going, we should remember where we are coming from.